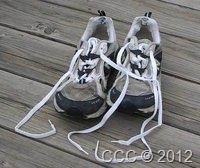 Okay, maybe people can say that shoelaces are obsolete now. Who wants to tie their shoelaces when they have velcro? Or slip-on shoes?